Carbamazepine (Tegretol) has been used for the treatment of trigeminal neuralgias since 1960. Since carbamazepine received approval for use as an antiepileptic agent in the United States in 1974, it became widely used for the management of partial or tonic-clonic epilepsy. Carbamazepine is also used as a treatment for patients with manic-depressive illness, postherpetic neuralgia, and phantom limb pain. Some of the available dosage forms for carbamazepine include 100-mg and 200-mg oral tablets and a 100 mg/5 mL oral suspension. The therapeutic plasma concentration is 4-12 mg/L. A peak plasma level is achieved in 6-24 hours. Controlled-release formulation could result in peak levels as late as 4 days after administration. The volume of distribution is 1-2 L/kg. Carbamazepine is approximately 75-80% protein bound, and approximately 2-3% is excreted unchanged in the urine. Carbamazepine is oxidized by hepatic microsomal enzymes to produce its active metabolite, carbamazepine 10,11-epoxide. The serum concentration of the epoxide metabolite is approximately 20% in children and 10-15% in adults. Autoinduction of microsomal enzyme results in a shorter carbamazepine half-life (10-20 h) in patients who use the drug long-term compared with those with a short-term exposure (31-35 h). The autoinduction process takes about 4 weeks. In terms of drug interactions, carbamazepine induces the metabolism of other anticonvulsant drugs such as phenytoin, clonazepam, primidone, valproic acid, and ethosuximide. This may lead to subtherapeutic levels of these drugs, especially phenytoin. Inhibitors of hepatic microsomal enzymes, such as erythromycin, clarithromycin, and cimetidine, increase carbamazepine levels and may cause toxicity. Carbamazepine may increase the toxicity of adenosine and may increase the risk of heart block. Lower initial doses of adenosine should be used in patients who are taking carbamazepine. Carbamazepine is a complex drug that has both anticonvulsant properties in therapeutic doses and a proconvulsant property in overdose situations with supratherapeutic serum levels. 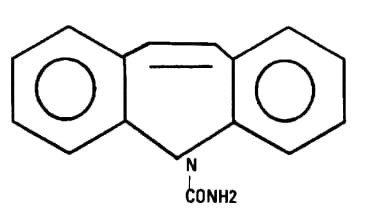 Carbamazepine is chemically and stereospatially related to the tricyclic antidepressant (TCA) imipramine; it is spatially similar to phenytoin. The therapeutic anticonvulsant mechanism of carbamazepine is similar to phenytoin and is believed to be primarily related to the blockade of presynaptic voltage-gated sodium channels. Blockage of sodium channels is believed to inhibit the release of synaptic glutamate and possibly other neurotransmitters. It also inhibits N -methyl-D-aspartate (NMDA) receptors and CNS adenosine receptors. Carbamazepine also has powerful anticholinergic properties through inhibition of the muscarinic and nicotinic acetylcholine receptors. The seizures that occur with carbamazepine toxicity are largely secondary to a central anticholinergic syndrome. The coma and respiratory depression associated with overdose may be related to sodium channel suppression of neurotransmission. Carbamazepine causes antagonism at the adenosine subtype A1 receptor and agonism at the adenosine subtype A2 receptor. In lower therapeutic doses, this may be partially responsible for the anticonvulsant effect, whereas, in overdose situations, it may increase sedation or precipitate coma. Cardiac arrhythmias due to carbamazepine are related to its sodium channel and anticholinergic effects. In therapeutic doses, the cardiovascular sodium channels are only minimally affected, and carbamazepine does not appear to be proarrhythmic. However, in overdose situations, carbamazepine produces sodium channel blockade effects similar to those of TCAs. In 2014, among 1880 single exposures to carbamazepine, 62 patients experienced major toxicity, but no deaths were reported. Complications of severe poisoning include coma, respiratory depression, seizures, hypotension, and GI hypomotility. Cardiac toxicity is uncommon in children, especially in those who have a structurally normal heart. A discussion regarding the prevention of unintentional ingestion is an important component of the routine care of the child. The patient's parents should be taught how to safely store medications. For patient education resources, see the Drug Overdose Center and Poisoning - First Aid and Emergency Center, as well as Poisoning, Drug Overdose, Activated Charcoal, and Poison Proofing Your Home. Brodie MJ, Mintzer S, Pack AM, Gidal BE, Vecht CJ, Schmidt D. Enzyme induction with antiepileptic drugs: cause for concern?. Epilepsia. 2013 Jan. 54(1):11-27. [Medline]. Davis AR, Westhoff CL, Stanczyk FZ. Carbamazepine coadministration with an oral contraceptive: effects on steroid pharmacokinetics, ovulation, and bleeding. Epilepsia. 2011 Feb. 52(2):243-7. [Medline]. [Full Text]. Darwish M, Bond M, Yang R, Hellriegel ET, Robertson P Jr. Evaluation of the potential for pharmacokinetic drug-drug interaction between armodafinil and carbamazepine in healthy adults. Clin Ther. 2015 Feb 1. 37 (2):325-37. [Medline]. Li ZH, Zlabek V, Velisek J, et al. Acute toxicity of carbamazepine to juvenile rainbow trout (Oncorhynchus mykiss): effects on antioxidant responses, hematological parameters and hepatic EROD. Ecotoxicol Environ Saf. March 2011. 74(3):319-27. [Medline]. Berghuis B, de Haan GJ, van den Broek MP, Sander JW, Lindhout D, Koeleman BP. Epidemiology, pathophysiology and putative genetic basis of carbamazepine- and oxcarbazepine-induced hyponatremia. Eur J Neurol. 2016 Sep. 23 (9):1393-9. [Medline]. Litovitz TL, Klein-Schwartz W, White S, Cobaugh DJ, Youniss J, Omslaer JC, et al. 2000 Annual report of the American Association of Poison Control Centers Toxic Exposure Surveillance System. Am J Emerg Med. 2001 Sep. 19(5):337-95. [Medline]. Spiller HA, Strauch J, Essing-Spiller SJ, Burns G. Thirteen years of oxcarbazepine exposures reported to US poison centers: 2000 to 2012. Hum Exp Toxicol. 2016 Oct. 35 (10):1055-9. [Medline]. Dogan M, Yilmaz C, Temel H, Çaksen H, Taskin G. A case of carbamazepine intoxication in a young boy. J Emerg Med. 2010 Nov. 39(5):655-6. [Medline]. Narita H, Ozawa T, Nishiyama T, et al. An atypical case of fulminant interstitial pneumonitis induced by carbamazepine. Curr Drug Saf. 2009 Jan. 4(1):30-3. [Medline]. Celik IE, Akyel A, Colgecen M, Ozeke O. A rare cause of 2:1 atrioventricular block: carbamazepine. Am J Emerg Med. 2015 Oct. 33 (10):1541.e3-4. [Medline]. Higuchi S, Yano A, Takai S, Tsuneyama K, Fukami T, Nakajima M, et al. Metabolic activation and inflammation reactions involved in carbamazepine-induced liver injury. Toxicol Sci. 2012 Nov. 130(1):4-16. [Medline]. Go T. Carbamazepine-induced IgG1 and IgG2 deficiency associated with B cell maturation defect. Seizure. 2004 Apr. 13(3):187-90. [Medline]. Sevketoglu E, Hatipoglu S, Akman M, Bicer S. Toxic epidermal necrolysis in a child after carbamazepine dosage increment. Pediatr Emerg Care. 2009 Feb. 25(2):93-5. [Medline]. Suzuki Y, Fukuda M, Tohyama M, et al. Carbamazepine-induced drug-induced hypersensitivity syndrome in a 14-year-old Japanese boy. Epilepsia. 2008 Dec. 49(12):2118-21. [Medline]. Locharernkul C, Loplumlert J, Limotai C, et al. Carbamazepine and phenytoin induced Stevens-Johnson syndrome is associated with HLA-B*1502 allele in Thai population. Epilepsia. 2008 Dec. 49(12):2087-91. [Medline]. Zhang Y, Wang J, Zhao LM, Peng W, Shen GQ, Xue L, et al. Strong association between HLA-B*1502 and carbamazepine-induced Stevens-Johnson syndrome and toxic epidermal necrolysis in mainland Han Chinese patients. Eur J Clin Pharmacol. September 2011. 67(9):885-887. [Medline]. Chen P, Lin JJ, Lu CS, et al. Carbamazepine-induced toxic effects and HLA-B*1502 screening in Taiwan. N Engl J Med. March 2011. 364(12):1126-33. [Medline]. McCormack M, Alfirevic A, Bourgeois S et al. HLA-A*3101 and carbamazepine-induced hypersensitivity reactions in Europeans. N Engl J Med. March 2011. 364(12):1134-43. [Medline]. Aggarwal A, Rastogi N, Mittal H, et al. Thyroid hormone levels in children receiving carbamazepine or valproate. Pediatr Neurol. Sep 2011. 45(3):159-62. [Medline]. Spiller HA, Carlisle RD. Status epilepticus after massive carbamazepine overdose. J Toxicol Clin Toxicol. 2002. 40(1):81-90. [Medline]. Lucas C, Donovan P. Just a repeat' - When drug monitoring is indicated. Aust Fam Physician. Jan-Feb 2013. 42(1-2):18-22. [Medline]. Patel VH, Schindlbeck MA, Bryant SM. Delayed elevation in carbamazepine concentrations after overdose: a retrospective poison center study. Am J Ther. Nov-Dec 2013. 20(6):602-6. [Medline]. Baker GA, Bromley RL, Briggs M, Cheyne CP, Cohen MJ, García-Fiñana M, et al. IQ at 6 years after in utero exposure to antiepileptic drugs: a controlled cohort study. Neurology. 2015 Jan 27. 84 (4):382-90. [Medline]. De Rubeis DA, Young GB. Continuous EEG monitoring in a patient with massive carbamazepine overdose. J Clin Neurophysiol. 2001 Mar. 18(2):166-8. [Medline]. Mantzouranis EC, Bertsias GK, Pallis EG, Tsatsakis AM. Hair analysis differentiates chronic from acute carbamazepine intoxication. Pediatr Neurol. 2004 Jul. 31(1):73-5. [Medline]. Doyon S. Antiepileptics. Hoffman RS, Howland MA, Lewin NA, Nelson LS, Goldfrank LR. Goldfrank's Toxicologic Emergencies. 10th ed. New York, NY: McGraw-Hill Education; 2015. [Guideline] Benson BE, Hoppu K, Troutman WG, Bedry R, Erdman A, Höjer J, et al. Position paper update: gastric lavage for gastrointestinal decontamination. Clin Toxicol (Phila). 2013 Mar. 51 (3):140-6. [Medline]. Deshpande G, Meert KL, Valentini RP. Repeat charcoal hemoperfusion treatments in life threatening carbamazepine overdose. Pediatr Nephrol. 1999 Nov. 13(9):775-7. [Medline]. Askenazi DJ, Goldstein SL, Chang IF, et al. Management of a severe carbamazepine overdose using albumin-enhanced continuous venovenous hemodialysis. Pediatrics. 2004 Feb. 113(2):406-9. [Medline]. [Full Text]. Yildiz TS, Toprak DG, Arisoy ES, Solak M, Toker K. Continuous venovenous hemodiafiltration to treat controlled-release carbamazepine overdose in a pediatric patient. Paediatr Anaesth. 2006 Nov. 16(11):1176-8. [Medline]. Bek K, Kocak S, Ozkaya O, et al. Carbamazepine poisoning managed with haemodialysis and haemoperfusion in three adolescents. Nephrology (Carlton). 2007 Feb. 12(1):33-5. [Medline]. Harder JL, Heung M, Vilay AM, et al. Carbamazepine and the active epoxide metabolite are effectively cleared by hemodialysis followed by continuous venovenous hemodialysis in an acute overdose. Hemodial Int. July 2011. 15(3):412-5. [Medline]. Ram Prabahar M, Raja Karthik K, Singh M, et al. Successful treatment of carbamazepine poisoning with hemodialysis: a case report and review of the literature. Hemodial Int. July 2011. 15(3):407-11. [Medline]. [Guideline] Ghannoum M, Yates C, Galvao TF, Sowinski KM, Vo TH, Coogan A, et al. Extracorporeal treatment for carbamazepine poisoning: systematic review and recommendations from the EXTRIP workgroup. Clin Toxicol (Phila). 2014 Dec. 52 (10):993-1004. [Medline]. Andersohn F, Konzen C, Garbe E. Systematic review: agranulocytosis induced by nonchemotherapy drugs. Ann Intern Med. 2007 May 1. 146(9):657-65. [Medline]. Fleischman A, Chiang VW. Carbamazepine overdose recognized by a tricyclic antidepressant assay. Pediatrics. 2001 Jan. 107(1):176-7. [Medline]. [Full Text]. Graudins A, Peden G, Dowsett RP. Massive overdose with controlled-release carbamazepine resulting in delayed peak serum concentrations and life-threatening toxicity. Emerg Med (Fremantle). 2002 Mar. 14(1):89-94. [Medline]. Marini AM, Choi JY, Labutta RJ. Transient neurologic deficits associated with carbamazepine-induced hypertension. Clin Neuropharmacol. 2003 Jul-Aug. 26(4):174-6. [Medline]. Morselli PL, Frigerio A. Metabolism and Pharmacolinetics of Carbamazepine. Drug Metab Rev. 1975. 4(1):97-113. [Medline]. Spiller HA. Management of carbamazepine overdose. Pediatr Emerg Care. 2001 Dec. 17(6):452-6. [Medline]. The authors and editors of Medscape Reference gratefully acknowledge the contributions of previous author Girish G Deshpande, MD, to the original writing and development of this article.